I gathered a few essentials — cell phone, notebook, pen, face towel and swimming goggles — and left my apartment. I Whatsapp'ed my brother Kelvin and asked him to meet me at Lippo Centre in Admiralty. From there, the two of us walked to the section of Connaught Road that had been just taken over by protesters and regular citizens who had come to support them. We were about 50 yards from the Tamar Government Headquarters, the epicenter of a massive student protest. It was 3:45 pm. Outside the Government Headquarters, there were throngs of people all around us, the average age somewhere between 20 and 25. Their growing euphoria was suffused with tension and trepidation. Many among the crowds were wearing lab goggles and raincoats to guard against pepper spray. Some put cling wrap over their eye gear for extra protection. Tanya Chan (陳淑莊), vice chairlady of the Civic Party, was speaking into a bullhorn. She had shaved her head as part of the pan-democrats' pledge to defeat a Beijing-backed electoral reform bill in the legislation. A student wove through the crowd with a loudspeaker broadcasting her words. Chan urged citizens to hold the line outside the Bank of China Tower to stop police from advancing. She also warned them about undercover officers infiltrating the crowds to collect intelligence. “Strike up a conversation with anyone who looks like a cop and ask him why he is here,” she said, "Look for men who are beefier than the average scrawny student!" Her remark drew a few nervous laughs. From afar, someone yelled “Saline water! We need saline water NOW!” Other supplies were also needed: face masks, umbrellas and drinking water. Kelvin and I went to see what we could do to help. We joined the human chain passing sundry items from one side of the eight-lane Connaught Road to the other. They were for student protesters who had been pepper-sprayed by police on Tim Mei Avenue, one of the several frontlines. The girl next to me, who might have been 15, shoved a carton of fresh milk into my hand. “Pass it on,” the teenager yelled. Milk was supposed to sooth the eyes by neutralizing the irritants in the pepper spray. There was order in this chaos: everyone was a commander and everyone was a foot soldier. We hit a lull in the calls for supplies. I told Kelvin I needed to use the bathroom and we walked to the nearby Queensway Plaza shopping mall. On our way back, I suggested we grab a few things for the frontlines. My brother had overheard that saline water was in short supply, and so we spent the next 45 minutes scouring Wanchai for pharmacies, because other volunteers had already emptied the shelves within the 300-yard radius of Admiralty. As Kelvin and I were paying for saline water at a neighborhood drugstore, we saw a text message on our phones. 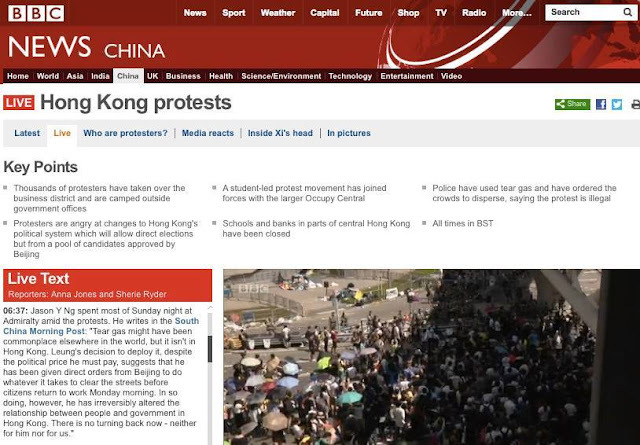 “Police have just fired tear gas into the crowds!” The text was from my sister-in-law who had been monitoring the latest developments on her television at home. We sensed the gravity of the situation and began running with our purchases back to Admiralty. Many started cursing at the police officers standing guard in the area. “Have you all gone mad?” shut one woman. “How could you do this to unarmed students? Don’t you have children of your own?” asked another. Over the next hour, we kept hearing shots being fired. Boom boom boom, like fireworks on Chinese New Year's Day. 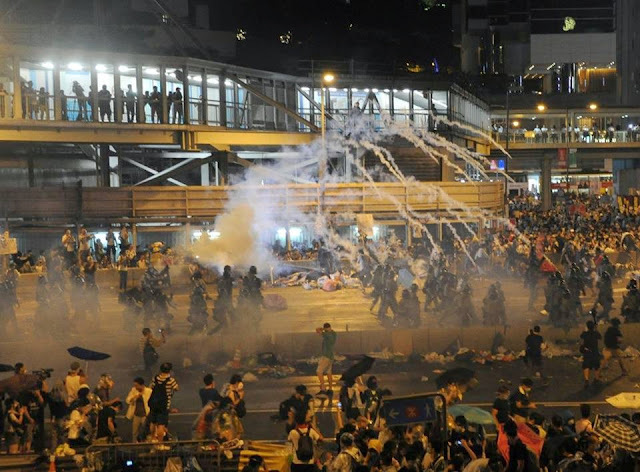 The use of tear gas had caught the city by surprise. It recalled an episode in the 2012 chief executive election, when the then-candidate C.Y. Leung was accused by his opponent Henry Tang of proposing at cabinet meeting that riot police and tear gas be unleashed on protesters. 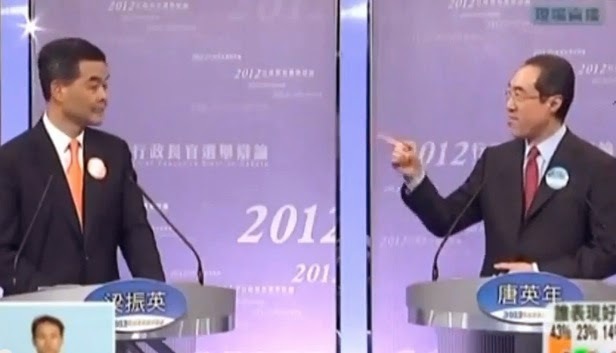 Leung vehemently denied it at the time and ended up winning the race anyway. It looked like the man who now held the highest office in the city had just fulfilled his opponent's words. "You lie! You said it!" 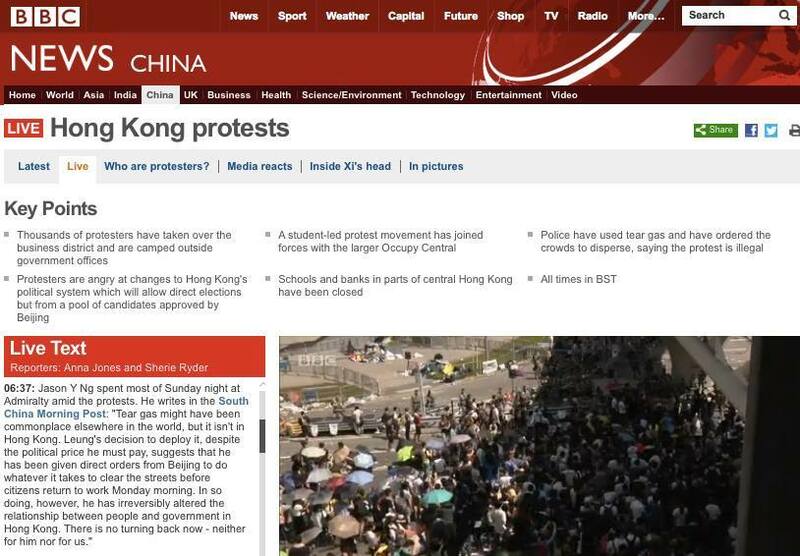 Tear gas might have been commonplace elsewhere in the world, but it wasn’t in Hong Kong. The last time it was used was during the 2005 World Trade Organization Conference to disperse angry South Korean farmers protesting outside the convention center in Wanchai with placards and Molotov cocktails. Leung’s decision to deploy lachrymators against unarmed students this time, despite the political price he would inevitably pay, suggested that he had been given direct orders from Beijing to do whatever it took to clear the streets before citizens returned to work Monday morning. In so doing, Leung had irreversibly redrawn the relationship between people and their government. As night fell, the tension rose. 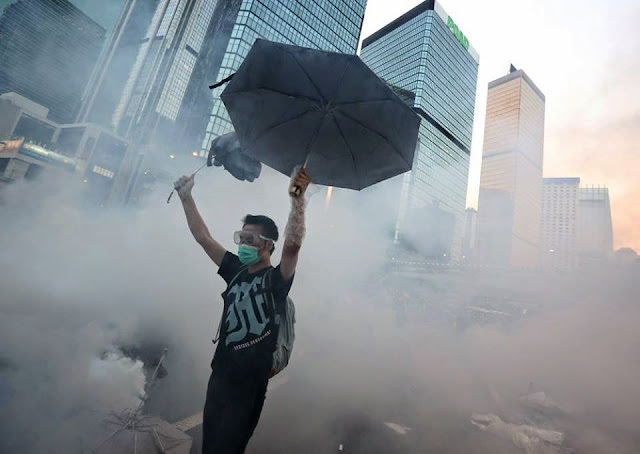 Harcourt Road — an eight-land thoroughfare that connects to Connaught Road — was strewn with broken umbrellas, water bottles and lone shoes, left behind by fleeing protesters. Mobile phones were rendered useless. Someone said the government had ordered service providers to switch off all 3G signals in the area. Kelvin asked me if I had downloaded FireChat, an app that allowed short text message exchanges between smart phones without a Wi-Fi or mobile connection. I said I hadn't, but I would as soon as my connection resumed. We moved to a footbridge outside the Police Headquarters on the ominously-named Arsenal Street. 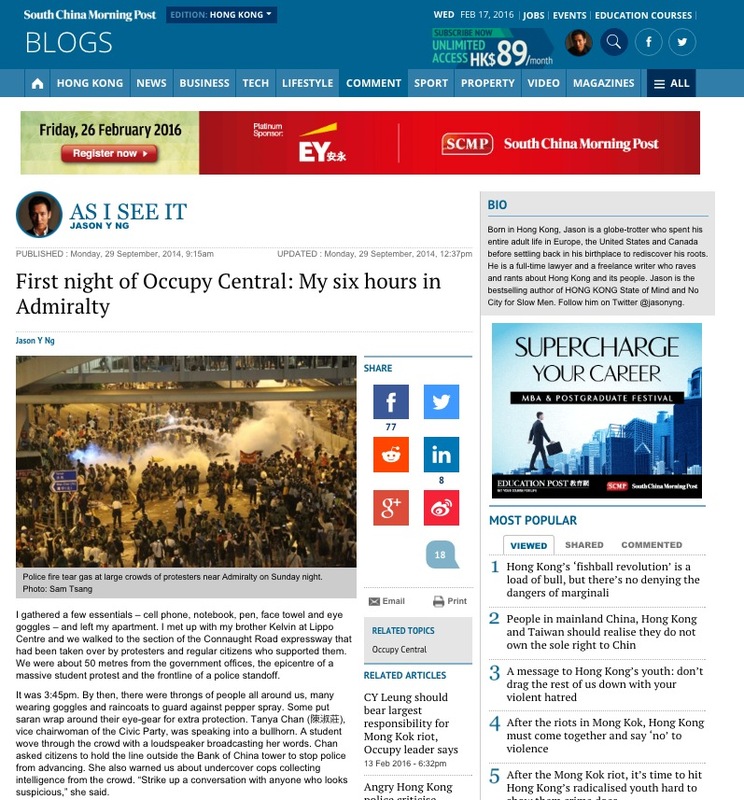 There, high above the ground, we saw a formation of riot police wearing army helmets and gas masks advancing steadily from Wanchai toward Admiralty. They were carrying AR-15 rifles and tear gas launchers; some of them had quivers of rolled-up warning flags strapped to their shoulders. Lit only by the streetlights' amber glow, the scene was eerily reminiscent of the streets of Beijing on that fateful June night in 1989. Many on the bridge began screaming at the crowd below: “Run! Riot police are approaching! Run!” That’s when I saw one of the police officers unfold a black banner. Seconds later, shots of tear gas arced through the dark sky, followed by clouds of white smoke billowing from the ground. The advancing fumes smelled like something between burning rubber and a very pungent mustard. Pandemonium ensued. A stranger came up to me and Kelvin and said, “You two need these,” and handed us two face masks. My eyes started to sting and I put on my swimming goggles. We ran with the retreating crowd and took shelter in the nearby Harcourt Garden. It was 9:30 pm. There were rumors that riot police would start dispersing the crowds with rubber bullets and even live ammunition. Kelvin and I agreed that we should heed the ushers’ warning and leave Admiralty for our own safety. My brother lived in Wanchai and I in Pokfulam. We said goodbye to each other and parted ways. 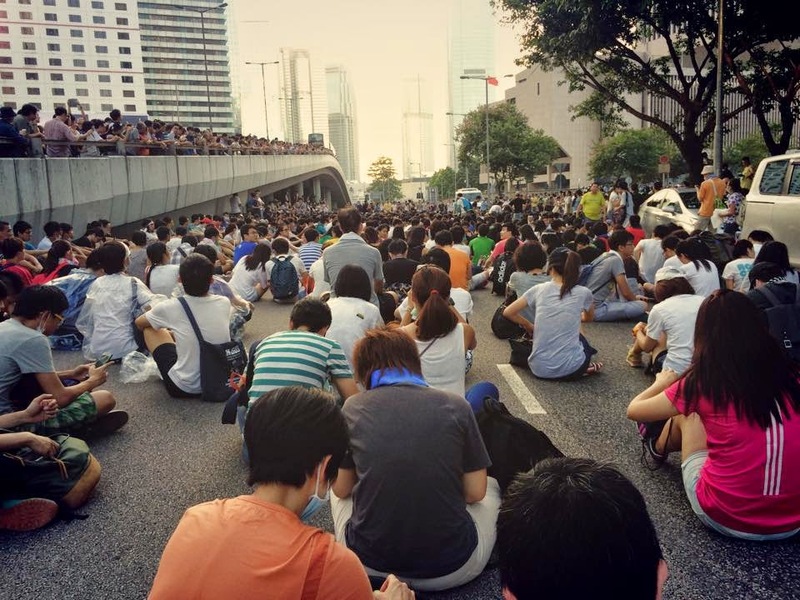 By then almost every road between Wanchai and downtown Central had been blocked, either by police or by makeshift blockades set up by students. I walked two miles to Sai Ying Pun, before finding a taxi to take me home. During my 30-minute trek, I downloaded the FireChat app recommended by Kelvin. I joined a few chat groups and saw users with strange names exchanging intelligence on the frontlines. Some said police had started arresting anyone seen wearing a yellow ribbon, while others claimed they spotted a Chinese armored vehicle crossing the Western Tunnel and heading toward Admiralty. It was hard to tell rumor from truth. I felt like a fugitive in a cold war spy movie. A single thought kept running through my head: what is happening to my city? Perhaps years later, citizens would look back and tell themselves that this was a good night. Like bitter Chinese medicine, what went down today would make us stronger and better. But like that bitter Chinese medicine, it was difficult to swallow. Home had never felt safer or more needed. I took a shower and sat idly in bed. What had transpired in the last few hours suddenly hit me, as images and sounds finally sank in. I started to sob, and my hands shook despite myself. Tonight in Hong Kong, there were prayers, tears and a lot of unanswered questions. I turned on my computer and started writing. I wanted the world to know. This article was published on SCMP.com under the title "First night of Occupy Central: my six hours in Admiralty." This article was cited by BBC News.